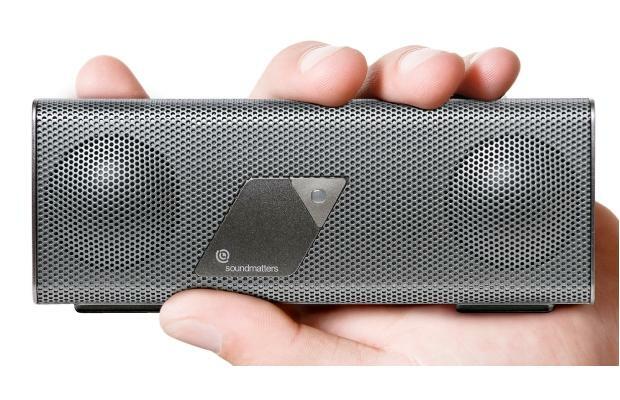 It’s pocket-sized but packs a punch: The foxL v2 Platinum portable speaker by Soundmatters makes a great gift. OTTAWA — Let’s face it … despite the Christmas cheer and the joy of the season, holiday gift giving can be a little stressful. First you have to think of the perfect gift. Then you have to find the real-life version of your imagined perfect gift. And then you have to make sure you didn’t give the person a similar gift last year. Phew, I’m exhausted just thinking about it. To help out, here’s an easy list of gifts for the condo owner. Depending on how well you know someone, the natural choice is a plant or floral arrangement. While a closer friend could receive an indoor plant, someone you don’t know that well perhaps should receive a floral arrangement instead. This is simply because flowers are temporary and you should make sure a plant would be a welcome addition to a home before inflicting it on a condo owner. When opting for floral arrangements, consider something that will harness the holiday spirit. Large poinsettias and amaryllises will really help get you in the Christmas spirit. If purchasing a more permanent plant, consult with a plant supplier or florist to come up with an appropriate one. Take into account which direction your friend’s condo faces. Is there western exposure? How will different plants grow in the light available? A monthly subscription to a magazine is a great gift, as it will pay out 12 times, rather than just once. Consider the recipient’s tastes carefully before choosing. If you met him or her at the gym, perhaps Runner’s World might be appropriate. If, however, you met the same person at Weight Watchers, this might be a less appropriate gift. Be careful not to be ironic or insensitive when giving a subscription. Also, avoid picking something too close to work. A doctor might already have a subscription to The New England Journal of Medicine or choose not to read more about a subject so close to work in his personal time, for instance. New condo owners might be interested in Architectural Digest or Veranda magazine for their design ideas. For the more serious reader or design addict, purchase a beautiful book in art, architecture or design. A good, old-fashioned coffee table book is a useful addition to any home, not only to provide inspiration, but also as a decor accessory. It’s also not something someone would purchase for themselves. One of my favourite gift ideas is Design Within Reach’s Sapien Bookcase. This fabulous shelving unit creates the illusion of a sky-high stack of books, while making it easy to pull books out for a quick read. Its narrow design means it barely takes up any space, but still manages to hold up to 70 books. A condo dweller will love this gift given its sleek look and the minimal space it assumes. If you know someone has similar musical taste to you, buy them a great album (either on CD or iTunes). If you are unsure, consider a giftcard to iTunes (but be sure to purchase it in the country it will be used; don’t give a Canadian card to an American). If you don’t know someone’s taste in music, you can also go neutral by purchasing portable speakers for them. This pricier gift will keep giving as it can be used again and again for years to come. The best speaker on the market for use in a condo just might be the foxL v2 Platinum speaker, which has amazing sound (soundmatters.com). (My brother is an audiophile and our entire family enjoys these speakers.) Designed by a rocket scientist, they make the perfect gift for any condo owner. They even travel well and may be bluetoothed with your iPhone. There are a few ways you can give the gift of the ultimate movie night. First, pick up a popcorn maker. Popcorn is a healthy(ish) New Year’s treat and making it in a popcorn machine seems extra special. If you’re looking for a more packaged deal, consider buying a Netflix subscription, a container full of old-fashioned popping corn and David’s Tea’s festive Movie Night tea, which has, among other ingredients, popcorn. Getting gifts engraved is a great way of showing someone you really thought about them. While this can be applied to many gifts, some personal favourites are monogrammed blankets and towels (perhaps for a guest bathroom), stationary with a condo owner’s new address or a keychain. Tip: If having a keychain engraved, make sure not to have the owner’s full name or address etched onto the ring. That way, if the keys are lost, there will be less ado. Remember that, when giving, it’s the thought that counts, not the gift budget. To make the gift extra thoughtful, pair with a handwritten card. You don’t need to spend a lot on the card to make it nice. If you don’t know what to say, insert a relevant quote (from a movie you saw together or a favourite work of literature). Happy gifting. Marilyn Wilson has been selling real estate for more than 24 years and owns Marilyn Wilson Dream Properties Inc. Brokerage in Ottawa, an Exclusive Affiliate of Christie’s International Real Estate. She can be reached through dreamproperties.com.